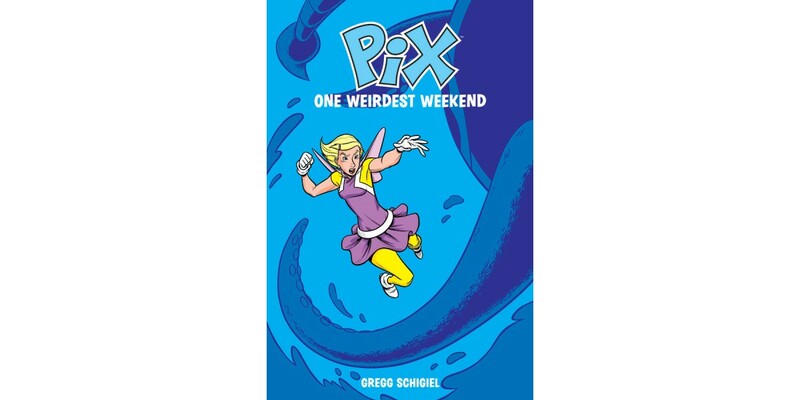 Image Comics is pleased to announce the middle-grade series PIX by Gregg Schigiel (writer and artist on SpongeBob Comics, writer of X-Babies: Stars Reborn), sure to enchant kids of all ages with a teen superhero who will fight her way into readers’ hearts. Schigiel, once part of Marvel Comics editorial, is perhaps best known for his work in SpongeBob Comics, where he's told numerous wacky stories as well as introduced Mermaid Girl to SpongeBob's Mermaid Man & Barnacle Boy pantheon. He brings the same humor and quirk, and more, to Pix’s story. Pix is a superhero—but she also believes herself to be a fairy and a princess to boot. And if that weren’t enough for one teen to juggle, in PIX, VOL. 1 she’s got attacking electronics, secret crushes, a magic 8-ball monster, cell service issues, a dragon war, a bad date, worried moms, a furtive frog, and a malevolent monkey, all jockeying for her attention. Think Spider-Man meets Riverdale with PIX—a lively, energetic story that drops an action-packed super-character in a small-town setting. PIX, VOL. 1: One Weirdest Weekend (ISBN: 978-1-5343-0140-5, Diamond Code DEC160764) will hit comic book stores on Wednesday, February 22nd. The final order cutoff deadline for comic book retailers is Monday, January 30th. “Highly recommended.” –Brad Guigar, Evil Inc.